An object may be made to balance at a particular point. When it is balanced at this point, the object does not turn and all the weight on one side of the pivot is balanced by the weight on the other side. This point is called the centre of mass, or centre of gravity, of the object. Centre of gravity is very important in the construction industry. 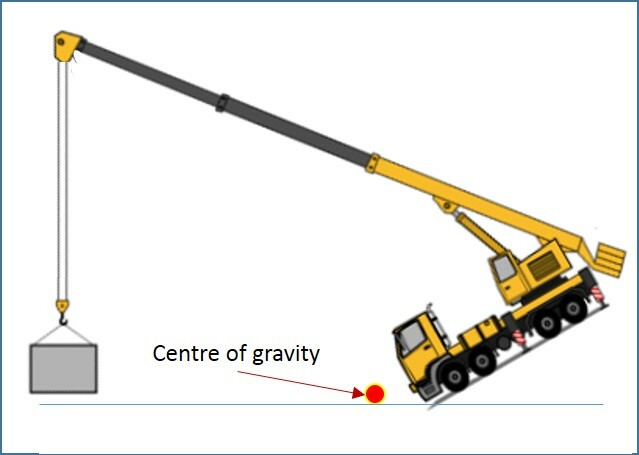 When operating cranes, a crane operator should always ensure that a centre of gravity is maintained within the crane’s body to avoid crane overturn. The centre of gravity of an object is the point at which the whole weight of the object may be considered to act. Two forces, equal in magnitude but opposite in direction and whose lines of action do not coincide, form a couple. For a vehicle to be stable, its centre of gravity should lie inside its wheelbase.